A radio station which has broadcast to hundreds of thousands of patients at a Bradford hospital will celebrates its 40th birthday on Valentine’s Day. Presenters past and present will join volunteers and special guests for a look back at four decades of St Luke’s Sound at a party to mark the occasion. The station was set up in the hospital administration block of St Luke’s Hospital in Little Horton Lane on Valentine’s Day 1979. The first programme featured show tunes and love songs. The presenter was founding member Philip Barfield, now the station’s Honorary Life President. Philip was awarded an MBE for his services to hospital radio in 2007 and will return to the radio station on its birthday for a live interview, recalling his years in front of the mic. Philip, of Thornton Road, Bradford, said: “We were all very nervous when we started out as it was the first time we had broadcast live. I dedicated the first piece of music – ‘Whistle A Happy Tune’ – to all the new presenters as our knees were knocking and our hands shaking. “St Luke’s Sound was originally called Radio 573 after the telephone extension number that patients could ring for a request or dedication, and records were loaned to the station by Woods Music Shop in the city centre and then returned after the show. Forty years ago the presenters broadcast from a very different radio station. 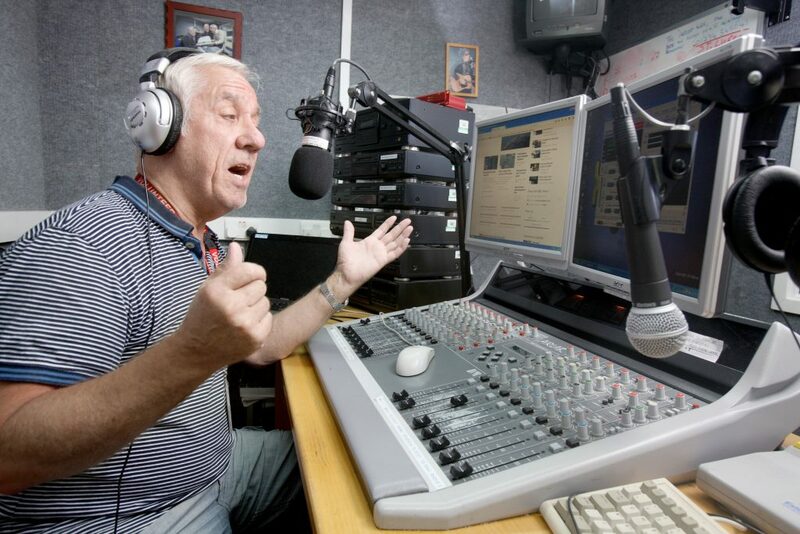 Chairman Jack Worsnop, 84, of Thornton Road, who joined the station 18 years ago, added: “In the early days, the broadcaster spoke into a microphone while another volunteer, at the other side of the mixing desk, put the records on the turntable and cued up the music. “Then we went from CDs to tracks on computers and in September 2018 St Luke’s Sound went live, streaming our hospital radio station online. This means we can now be heard across the world, so relatives and friends of patients living in Bradford or abroad can send in requests and greetings to their loved ones while they are on our wards. Volunteers estimate the station has broadcast for more than 55,000 hours over four decades. A total of 15 presenters currently broadcast for 45 hours every week. To celebrate their 30th anniversary the station hosted a ‘radiothon’, where they broadcast for two days non-stop. St Luke’s Sound can be found at www.stlukessound.co.uk where a new website is currently under construction and there are plans to launch on Facebook and Twitter soon. Past presenters have gone on to work in commercial radio stations, including Wes Stakes, drive-time presenter on Trax FM, and Chris Johnson, who now presents the Breakfast Show on Pulse 2 across West Yorkshire from 6 to 10am every weekday. Chris said: I was a member of St Luke’s Sound hospital radio from 1985 to 2005 when I acted as record librarian, presenter and chairperson. As the station is self-funding, it is currently looking for local businesses to provide on-air sponsorship so it can continue to grow and flourish. Any companies interested in advertising should email studio@stlukessound.co.uk for further details. If you are interested in learning more about volunteering at St Luke’s Hospital or Bradford Royal Infirmary, please contact Voluntary Services at volunteer.information@bthft.nhs.uk or call (01274) 364309.